Colin Quinn Unconstitutional, a new comedy written by and starring Colin Quinn, has been extended at The Cherry Lane Theatre (38 Commerce Street) and the show will now close on August 8th. (The show was previously on sale through July 23). Colin Quinn Unconstitutional, is presented by Brillstein Entertainment Partners and Mike Lavoie. Directed by Rebecca A. Trent, Colin Quinn Unconstitutional is also produced by Brian Stern, with set design by James Fauvell, costume design by Alexis Forte, and lighting design by Sarah Lurie. 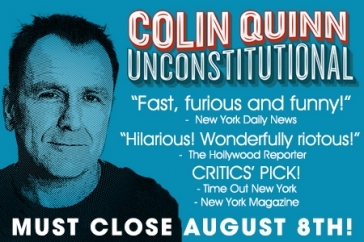 After the New York run of the show is completed, Colin Quinn Unconstitutional will embark on a tour in the fall, travelling to the original 13 colonies, in the sprit of the Constitution. Colin Quinn Unconstitutional marks Colin’s return to the New York stage after his acclaimed Broadway engagement of Long Story Short, for which he was nominated for the Drama Desk Award as well as an Emmy Award for the HBO broadcast of the play. Tickets can be purchased by visiting www.cherrylanetheatre.org or calling (212) 352-3101. For more information, please visit: www.ColinQuinnUnconstitutional.com.